Lemvig, with a population of 6,936 (2017), is the main town in Lemvig Municipality, Denmark. Lemvig is a 750-year-old market town, and received its municipal charter in 1545. One of the landmarks of Lemvig is the town church from the 13th century. The old town is situated between the Limfjord, a lake and some hills. The local topography was shaped during the last Ice Age. 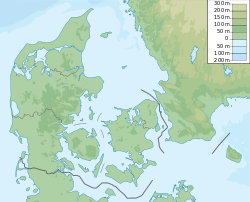 The town is situated 10 kilometers (6¼ miles) from the North Sea and 375 kilometers (233 mi) from Copenhagen. Lemvig has a grass airstrip (ICAO: EKLV). Lemvig's economy is based on traditional sectors such as metal, wood and furniture industry. Among the largest employers in the town are KK Electronics, Nilfisk-Advance, Cheminova and The Danish Coastal Directorate. Herman Bagger (1800 in Lemvig – 1880), Norwegian newspaper editor and politician. Sinne Eeg (born 1977 in Lemvig), Danish jazz vocalist and composer. Wikimedia Commons has media related to Lemvig.